El-Funoun was founded in 1979 by a small number of enthusiastic, talented and committed men and women, who collectively strove to present a special flavor of authentic Palestinian music and dance and safeguard this heritage from expropriation and loss. Since the beginning, they have realized the importance of enhancing the connectedness of Palestinians wherever they are with their roots, culture and history. 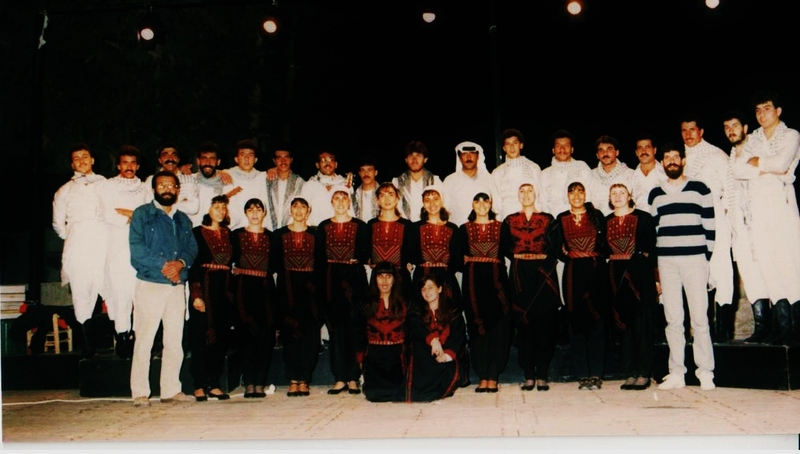 The group gave its first remarkable performance at the Dabke festival in Birzeit University in March 1979, after which the group decided to adopt the name “El-Funoun Palestinian Popular Dance Troupe”. Led by these convictions, El-Funoun continued to develop and grow despite the banning and expropriation of any form of Palestinian cultural expression by the Israeli occupation. In the 1980’s more enthusiasts joined El-Funoun believing in the crucial role of arts and culture in countering the systematic attempts by the Israeli occupation to suppress the Palestinian national identity. “Folkloric Scenes” in 1982 and “Wadi a-Tuffah” in 1984, followed by “Mish’al” in 1986 were the productions of El-Funoun emphasizing these convictions. They carried both an artistic and political messages and received an unprecedented popular attendance. Moreover, El-Funoun assumed a significant role in reviving the rich music and dance heritage, not only through its productions, but also by initiating the “Palestinian folklore day” in 1986 as an annual celebration, which falls on October 7th of each year. This initiation continued to be celebrated since then all over Palestine. In 1987 El-Funoun played a key role in establishing the Popular Art Centre, a community organization committed to raising awareness about the arts, as well as opening opportunities for community members to participate in artistic activity and expression. Through the Centre, El-Funoun’s message has been able to reach and affect many schools, organizations and localities. In Palestine, as well as in exile, El-Funoun has achieved an unprecedented popular recognition; in fact, quite a few of the Troupe’s songs and dances have become household tunes. El-Funoun has continued its generous artistic and community work, encompassing over the years hundreds of members coming from various social backgrounds. El-Funoun has become their second home and an arena where various generations meet: dancers, members, artists, administrators and board members motivated by the vision of the Troupe more than by any other factor. This has ensured over the years a strong sense of belonging to and ownership of the Troup.